One of the elements of a successful party is the appetizers and party food. Guests tend to gather wherever there is food, so it's best to serve appetizers they will enjoy. A party tray is a great way to serve a lot of food in one dish, and it is an attractive way to showcase your appetizers. While party trays are available at most grocery stores, I like to make my own. 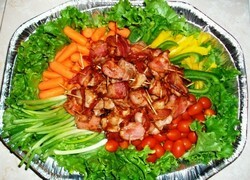 This party tray is easy to make, is colorful, and includes food selections most people enjoy. How Do You Like Your Party? Either works for me. I just like to party! Bacon will bring out the flavors in your pork loin, so it is an important ingredient! Simply cut the bacon slices in half, then place in a frying pan. Cook the slices until they are done, but not crisp. Each slice needs to be limp enough to wrap around your pork bites. Drain grease, and set slices aside to cool. Remove any membrane and fat from the pork loin, then cut in one-inch cubes. Season with salt and pepper to taste. Put barbecue sauce in a bowl, then dip each piece of pork loin in it to cover on all sides. Take one slice of bacon, and wrap it around the pork loin bite. Secure it with a tooth pick, and place into broiler pan. Repeat with each piece until all pork loin is wrapped. Preheat broiler, than place pork loin bites 5-6 inches from flame. Broil 4 minutes, remove pan from oven, turn pork pieces, and baste with additional BBQ sauce. Broil another 5-7 minutes until pork is done. Rinse all vegetables in cool water, then pat dry with a paper towel. A salad spinner works well to remove water from lettuce and other light-weight vegetables. With a sharp paring knife, remove any stems, roots or seeds from your vegetables. For green onions, cut off both the roots and part of the green tops. Line the bottom and sides of your serving tray with individual lettuce leaves. After lining the tray with lettuce, place vegetables around the side, allowing room in the center for your bacon-wrapped pork bites. One of the handiest kitchen tools I've ever owned is a salad spinner. They are so easy to use, and make drying lettuce and other vegetables a breeze! Simply place your lettuce inside the spinner, add cool water to rinse, then place the spinner basket inside the outer bowl. Turn the handle on top of the lid, and any remaining water moves to the outside of the inner basket. I like this particular spinner because it is easy to hold, and easy to drain. Many of the other spinners require you to remove the lid to drain. This one has spouts, so the water can be drained without removing the wet vegetable. 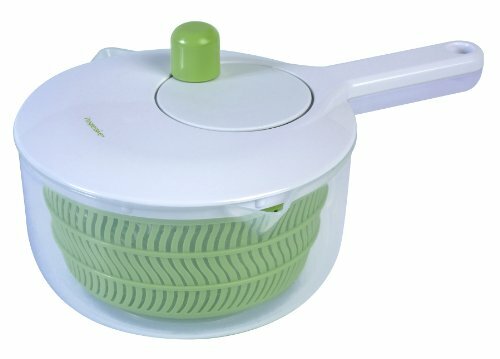 If you don't have a salad spinner and eat fresh vegetables, purchase this Progressive International SALL-6 Salad Spinner. For a small investment, you'll enjoy crispier, tastier, drier vegetables! After you are satisfied with the arrangement of your fresh vegetables, place your bacon-wrapped pork bites in the center. The only step remaining? Place the appetizer tray on your table, and let your guests enjoy! Add a bit of color to your table and party tray by choosing a variety of vegetables. For bell peppers, offer the green, gold and red varieties. Radishes and cherry tomatoes add a bit of red, while cauliflower will bring out the color in the lettuce. Mix and match to see which vegetables are the most attractive! Any flavor of BBQ sauce works well with pork, so use the kind you like the best. However, if you use honey-flavored barbecue sauce, make certain your bacon isn't maple. Flavors should be complementary. Instead of BBQ sauce, try Italian dressing or Dijon mustard to coat your pork loin bites. Or try all three! Potato salad just like Mom used to make. Another step-by-step recipe to ensure your baby back ribs are tender and delicious! What Type of Party Appetizers Do You Serve? I have never heard of this appetizer, but it sounds lovely. Thanks for the good idea. During the summer months, I get many requests to bring these to parties. I not only enjoy making them, but eating them as well! Your bacon wrapped pork loin bites sound tasty, seem easy to make, and your platter is quite attractive. Should be a party hit!